We understand that our architectural customers want straightforward communication, a quick turnaround on prices, lots of options available, steel and fabric specifications and CAD models. TensileFabric offers all of this and can support you through the process of specification with a fabric structure. Our pre-designed range of fabric structures is of the highest quality. The canopies have been fully designed so we can provide you with a full CAD model allowing them to be dropped into your drawings in seconds. This means that you have a canopy of proven design, easy to specify, quick to deliver and install, all at an affordable price. As well as our product ranges we also offer a fully bespoke service. Check out our bespoke portfolios for exterior structures, interior items, exhibition canopies and acoustic solutions, or contact us to discuss your specific project requirements. 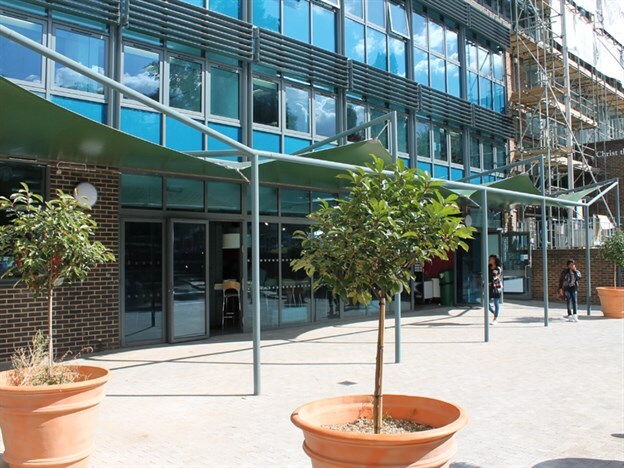 Exterior bespoke walkway and entrance canopy, Christ the King Sixth Form College, Lewisham. Designed by Graham Rivers Architects, Bristol Interior backdrop canopy, semi-permanent exhibition, V&A Museum, London.